Every interested dancer is allowed to register for the ETDS but not everybody is allowed to participate in the tournaments as a dancer. Special rule: Owners of a German “Startkarte“, Dutch “Debutanten 4 & 5“ or the international equivalents are allowed to dance in the „Breitensport“. Special rule for German D-class or international equivalent: The participation in the „Breitensport“ for D-class dancers, Dutch “Debutanten 2 & 3” and others (see figure) is only allowed, if they do not start with their regular partner. After having achieved places 1 – 3 in the highest “Breitensport” class (latin or ballroom) in two out of three successive ETDS- tournaments, a participant is excluded from the “Breitensport” tournament in the corresponding section and may only start in the Open category. Formation dancers from German “Landesliga” are allowed to participate in the “Breitensport”. German “Oberliga” dancers are regarded as D-class dancers and are not allowed to dance with their regular dancing partner in the “Breitensport” tournament. Formation dancers of higher leagues have to compete in the Open category. In case of a DTV starting book of B-, A- or S-class or the international equivalent (see figure) in one discipline, dancers are also excluded from the “Breitensport” tournament in the other discipline. Dancers, who participated in former ETDS’s in the „Breitensport“ tournament at least in one section (latin or ballroom). Exception: Current trainers of university dance classes are allowed to participate in the Open, even if they have not been “Breitensport” in earlier ETDS’s. Dancing partners for the Open will be drawn by lots. Nobody is allowed to dance with his regular dancing partner. Participation in each section (latin or ballroom) is only possible in „Breitensport“ OR Open. 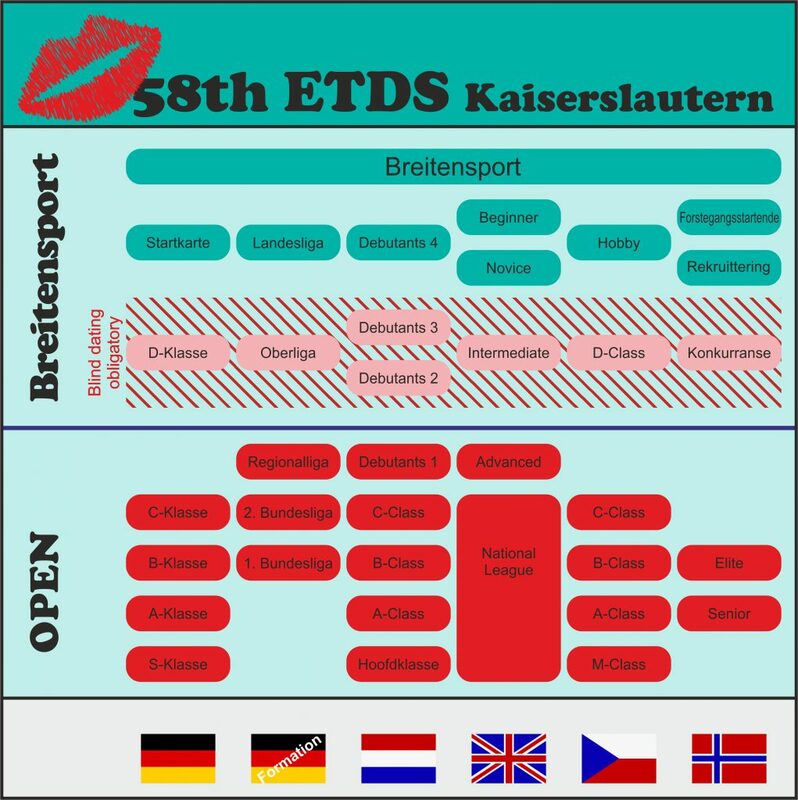 All dancers who do not fulfill the above stated requirements for “Breitensport” or Open, are welcome to visit the ETDS as volunteer, spectator or adjudicator, but they are excluded from the dancing tournaments.